Wallets have come a long way from the boring leather bifold of yesteryear. 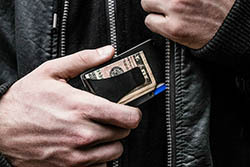 Modern wallets for men have a unique style and flair of their own. They’re a practical and versatile accessory that makes it possible for you to carry around all of the essentials while still expressing your individual style. If you’re in the market for a new wallet, why not go with something a bit more distinct? Here’s a collection of cool and stylish wallets that never go out of style. Each option has a sophisticated design that can complement a variety of different looks. Whether you use the wallet for special occasions or as your everyday essential, it’ll stand out for all the right reasons. Many of these wallets also have some additional features you won’t find in your old wallet. Designers have put the needs of modern men at the forefront to deliver a functional wallet that’ll make everyday life that much easier. If you’re looking for something rugged and safe,this wallet is a great option. It features a long 16-inch chain that easily attaches to your belt loop. The chain ensures that the wallet can’t fall out or get stolen without your knowledge. The wallet itself is made from brown crazy horse leather. It’s soft to the touch and very resilient to damage. With nine card slots, three over-sized pockets, and two bill sections, there’s more than enough room to keep you covered. The wallet also has RFID protection. It’s designed and tested to block the 13.56 MHz frequency, keeping your sensitive card information away from would be thieves. 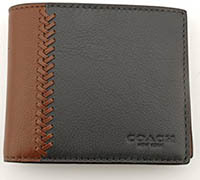 This wallet from the luxury designer brand Coach has a masculine and sporty look. The outside of the wallet is made from black and brown leather. These two types of leather are fused together using a familiar baseball stitch. The brown leather inside has enough room for eight cards and plenty of bills. There’s also a removable pass case for when you only want to take identification with you. The pass case is made from the same high-quality leather and features a clear plastic window for quick visual access to any important cards. For those days that you want to keep things simple,the Ebax minimalist wallet is great for holding onto the essentials and nothing else. Instead of a bulky bi-fold design, this wallet utilizes elastic bands to keep up to eight cards contained. Two additional compartments on either side can be used to keep receipts or smaller items like headphones contained. The elastic is complemented with Italian suede leather. Overall, the design is compact and light. It’s small enough to fit into the front pocket for easy access. With a variety of different color combinations, you can easily find an option that suits your style. This wallet from FlyHawk puts two of your most carried items into one compact case. It’s a phone case that doubles as a slim minimalist wallet. 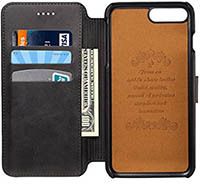 The phone case wallet is designed to fit the latest iPhone models. 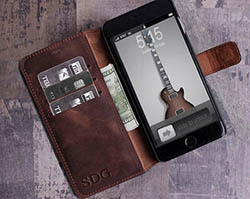 It provides the security you’d expect from a high-quality case but adds the convenience of a wallet right on the front. The folding wallet portion covers the screen of your phone and stays secure via a magnetic closure. 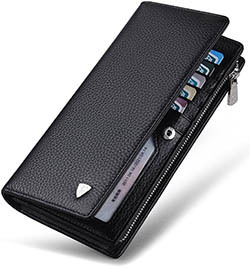 When opened, you can gain access to the three card slots and bill pocket. It’s made from cowhide leather and polyurethane that’s soft to the touch. The material keeps your precious phone safe while also keeping the essentials in one place. Made from full-grain leather, this wallet from Distil Union has a classic look. However, it contains a few unique features that provide a modern twist. Instead of a traditional bi-fold bill pocket, this wallet features an adjustable metal money clip. This money clip can keep your bills secure without an issue. Each side of the wallet also features two thin pockets. The pockets can hold a few cards each. A hidden pull tab is used to remove the cards with style. The unique design promotes a sophisticated and minimalist lifestyle. 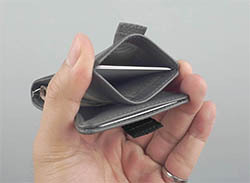 Despite the money clip and card pockets, the wallet remains relatively thin and discrete. This wallet is designed to carry a lot of items for travel or leisure. It’s made from imported Italian leather. The material is known for its impressive look, softness, and durability. A rust-resistant zipper is used to keep the larger pocket closed. Inside this pocket is enough room to carry a large phone, a checkbook, a hefty wad of cash, and much more. A snap closure keeps the second area closed. Within this compartment is enough room for up to 15 cards and identification. As a whole, the wallet is designed to look sleek and sophisticated. Even when stuffed full, the wallet stays organized and easy to handle. If you like to carry loose change, this wallet has you covered. It features a hinged coin sorter that keeps all your change organized and in view. Four different coin slots are perfectly sized to keep change snug. The coins automatically stack up as they are placed between the metal rails. The entire rail system utilizes a hinge to swing the coins out for easy access. When not in use, the coin sorter is tucked away behind an identification flap. The coins stay put in the sorter, even if the wallet gets turned upside down. Of course, there’s also a sizeable bill pocket and five card slots. 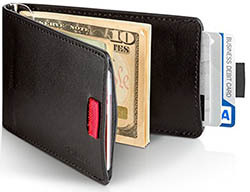 The outside of the wallet is made from durable black cowhide leather. Why Go With Something Cool and New? Let’s face it, most guys tend to stick with the same wallet for years at a time. It’s not uncommon to see men sporting the same chunky bi-fold that they used when they were teenagers. The needs of the modern man are constantly changing, so why not move with the times? One recurring design element from unique wallets is their slim form factor and versatile build. Minimalist wallets and phone case wallets are taking over because of the many advantages they have. Minimalist wallets promote simplicity and help you avoid clutter. Men are notorious for over-stuffing their simple bi-fold wallets. They’ll eventually become so bulky that they’re immediately noticeable in your pocket. Not only is that unsafe, but it can also be very uncomfortable. Minimalist wallets only allow you to carry the essentials, forcing you to be more organized and simple. The same goes for phone case wallets. Why carry around two bulky accessories when you can simply combine the two into one sleek item? Phone case wallets do double-duty to keep your device and items secure. They can be used in your front pocket and ensure that your cards and cash are always on hand. Not only that, but they provide a cool and sophisticated look to your phone that standard cases just can’t offer. Modern stylish wallets are also known for their high-quality materials. 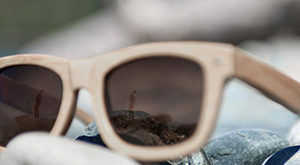 These materials look great and offer an unparalleled amount of protection. Superb Italian leathers and plush suede are a common occurrence in some of the most stylish options on the market. Natural materials like leather offer an inherent sense of masculinity and typically go well with any outfit. Furthermore, quality materials provide protection from moisture, abrasive damage, and rips, ensuring that these wallets can stay in prime condition. Whatever wallet you go with, it’s bound to be an upgrade from that old bulky wallet from years ago. These modern wallets offer unique style and flair that’ll set you apart from the crowd. If you’re feeling generous, they also make an excellent gift. There’s an option to suit any man. Gift recipients can update their style while improving the way they carry the essentials. These are just a few of the many great options out there. Check out some of the most popular men’s wallet brands to see some other high-quality options you’ll love. With a wide variety of styles, features, and brands, you’ll have no problem finding a new wallet that you’ll use for many years to come.